Here’s a creative, as well as attractive, method to conceal a well cap. They’re called mock rocks. In the landscape industry they’re used to camouflage undesirable exposed well caps, pumps, septic tank access lids, pipes, meters and sewer caps. The mock rock, plants and mulch are a total aesthetic turnaround on this property from when the well was drilled a few months ago. 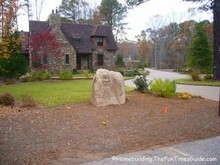 Jerry Bonner of Bonner Custom Homes chose to conceal the exposed water well pump in his front yard with a mock rock. My photos put them front and center but if you’re just driving by, you’d just think there was a huge boulder in his yard. It is not out of place with nearby Kennesaw Mountain and the huge boulders that you’ll find just about everywhere on the national park trail adjacent to his English cottage-style home and surrounding area. A side benefit, besides concealment, is protection from the elements, as well as instant access to the pump simply by lifting it off of the ground (after you’ve detached it from the ground stakes) to expose the well cap. Mock rocks usually consist of impact-resistant and weather-resistant plastic composite material for durability. If you’ve got an ugly utility-type “thing” sticking up out of your yard, consider hiding it with a mock rock. How much did it cost to drill this water well? See more photos and complete story on this water well being drilled.